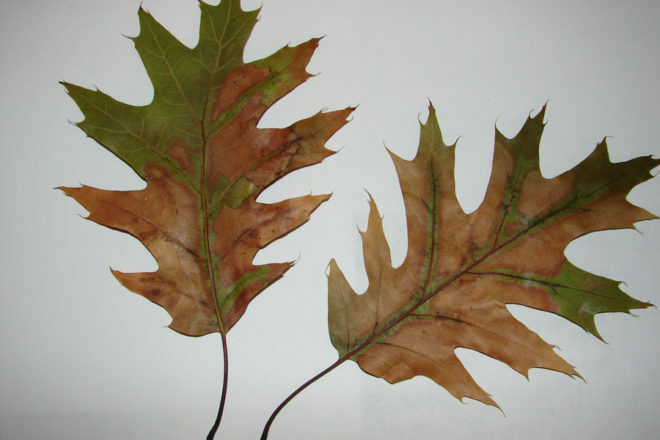 Leaves infected with oak wilt drop rapidly and appear bronze-green. Photo by DNR. Each year, a tree-killing fungal disease strikes and kills thousands of oak trees in Wisconsin’s forests, woodlots and urban areas. Oak wilt is common in southern and central Wisconsin and is becoming increasingly abundant in northern counties. It is difficult to control once the disease takes hold and prevention steps need to be taken to slow the spread. Oak wilt is confirmed in all Wisconsin counties except Ashland, Bayfield, Calumet, Door, Douglas, Forest, Iron, Kewaunee, Manitowoc, Sheboygan and Taylor counties. Oaks in the red oak group, including northern red, northern pin, and black oaks, are particularly vulnerable to oak wilt. Wilted leaves that drop from the top of the tree first. Dull green or bronze leaves that look water-soaked. Partially green leaves on the ground which have dropped from the tree. The University of Wisconsin’s Plant Disease Diagnostic Clinic can help verify the presence of oak wilt. Instructions for collecting and mailing samples to the clinic are available at plantpath.wisc.edu/pddc/ (exit DNR), or by calling 608.262.2863.